Daily news of the tribunal proceedings in Phnom Penh, Cambodia are a grim reminder of the atrocities that took the lives of an estimated 1.7 million Cambodians during the Khmer Rouge. One can only imagine how the testimony of those responsible for afflicting war crimes is affecting those who survived unspeakable conditions. While the making of art is a life force for the majority of traditional artists I’ve met, it is rarely as dramatically a matter of life and death as it has been for Yary Livan. 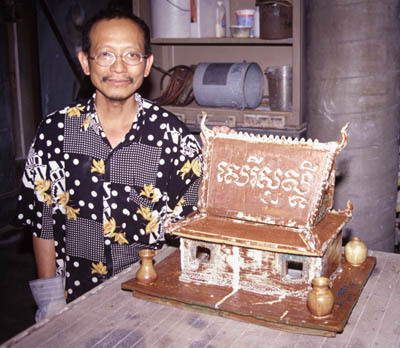 A Cambodian master ceramicist, Livan, the sole survivor of his generation of artists, trained in traditional Khmer ceramics at the Royal Academy of Fine Arts in Phnom Penh, Cambodia. Forced to hide his education to survive under the Khmer Rouge, it was ironically his knowledge of traditional wood-burning kilns that saved him from certain starvation. In 2001, Yary and his wife emigrated to Massachusetts. With support from leaders in the local Cambodian community and the arts education community, Yary was able to set up a studio. 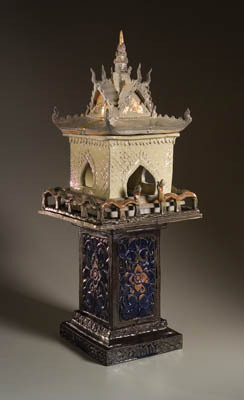 In no time, he began producing a surprising amount of work — flower vases, elephant pots, and spirit houses. You can listen to Yary’s story as told in this audio stop, produced by Acoustiguide for the exhibition.